©1995 Kluwer Academic Publishers. Printed in	the Netherlands. AZT, a chain terminator of DNA synthesis originally developed for	chemotherapy, is now prescribed as an antihuman immunodeficiency	virus (HIV) drug at 500 to 1500 mg/person/day, which corresponds to	20 to 60 µM AZT. The human dosage is based on a study by the	manufacturer of the drug and their collaborators, which reported in	1986 that the inhibitory dose for HIV replication was 0.05 to 0.5 µM AZT and that for human T-cells was 2000 to 20,000 times higher, i.e. 1000 ~M AZT. This suggested that HIV could be safely inhibited in	humans at 20 to 60 µM AZT. However, after the licensing of AZT as an	anti-HIV drug, several independent studies reported 20to 1000-fold	lower inhibitory doses of AZT for human and animal cells than did the	manufacturer's study, ranging from 1 to 50 µM. In accord with this,	life threatening toxic effects were reportod in humans treated with	AZT at 20 to 60 µM. Therefore, we have re-examined the growth	inhibitory doses of AZT for the human CEM T-cell line and several	other human and animal cells. It was found that at 10 µM and 25 µM	AZT, all cells are inhibited at least 50% after 6 to 12 days, and	between 20 and 100% after 38 to 48 days. Unexpectedly, variants of	all cell types emerged over time that were partially resistant to	AZT. It is concluded that AZT, at the dosage prescribed as an	anti-HIV drug, is highly toxic to human cells. AZT (3'-azido-3'-deoxythymidine) is an analog of thymidine in	which the 3' hydroxyl group is replaced by an azido group. This	prevents the extension of a growing DNA strand ending with AZT to the	five prime end of another nucleotide triphosphate. Thus AZT functions	as a chain terminator of DNA synthesis. AZT was originally designed in the 1960s to be used as	chemotherapy for leukemia (Horwitz, Chua & Noel, 1964). The	rationale for cancer chemotherapy is to kill cancer cells during	mitosis with cytotoxic chemicals like AZT. Because chemicals cannot	distinguish cancer cells from normal cells, the price for	chemotherapy is the death of normal cells that are in mitosis. Therefore, chemotherapy must be restrictod to days or weeks. Successful chemotherapy kills the cancer before it kills the host. Since 1987, chronic administration of AZT and similar nucleoside	analogs, like ddC and ddI, have been prescribed to AIDS patients to	inhibit human immunodeficiency virus (HIV), the presumed cause of	AIDS (Fischl et al., 1987; Richman et al., 1987; Yarchoan et al.,	1991). Since 1990, AZT has also been prescribed to healthy HIV	antibody-positive persons to prevent AIDS (Volberding et al., 1990;	Tokars et al., 1993; Seligmann et al., 1994). The rationale is to	inhibit HIV DNA synthesis at doses that do not inhibit cell DNA	synthesis (Yarchoan et al., 1991). It is claimed by	Burroughs-Wellcome, the manufacturer of AZT, and its collaborators	that this can be achieved, because AZT would inhibit DNA synthesis	with HIV DNA polymerase in vitro 100 times more effectively than DNA	synthesis with cellular DNA polymerase (Furman et al., 1986). Moreover, this study claimed that in vivo AZT was 2000 to 20,000	times more inhibitory to HIV replication, i.e. at 0.05 to 0.5 /1M,	than to cell division, i.e. at 1000 µM (Furman et al., 1986). Accordingly, anti-HIV doses of AZT were chosen to fall into this	therapeutic window, e.g. to be 500 to 1500 mg per person per day, or	about 20 to 60 µM per kg per day (Furman et al., 1986; Fischl et al.,	1987; Volberding et al., 1990; Physicians' Desk Reference, 1994). (i) Even if AZT were to inhibit HIV DNA synthesis 100 times more	than cell DNA synthesis, it could not 'selectively' inhibit HIV, as	is claimed by the manufacturer (Furman et al., 1986). Since HIV DNA	measures only 10 kb and cell DNA measures 106 kb, and since both DNAs	are made in vivo simultancously inside the same cell, cell DNA	provides a 105-fold bigger DNA target for AZT toxicity than does HIV	DNA. Therefore, the 100-fold higher selectivity of AZT claimed for	HIV DNA synthesis is immaterial. (ii) Inhibition of HIV DNA synthesis in HIVantibody positive	persons is completely unnecessary, because HIV does not spread in tte	presence of antiviral antibody (Duesberg, 1992). It is for this	reason that only about 1 in 1000 T-cells is ever infected in	HIV-antibody positive persons (Duesberg, 1992). The fact that only	about 0.1% of all susceptible T-cells are ever infected by HIV in	HIV-positive persons with and without AIDS proves that HIV is very	effectively neutralized by antiviral immunity. Moreover, there is no	correlation between the number of HIV-infected cells and AIDS	(Duesberg, 1993; Piatak et al., 1993). For example, there are healthy	HIV-positive persons who have 30 to 40 times more HIV-infected cells	than AIDS patients (Simmonds et al., 1990; Bagasra et al., 1992; Duesberg, 1992). (iii) Since only about 1 in lOOO T-cells are ever infected by HIV	in persons with or without AIDS (Duesberg, 1992; 1992), AZT must kill	999 uninfected cells in order to kill just one HIV-infected cell - a	very poor pharmacological index. Thus theory predicts that AZT cannot selectively restrict HIV	replication in vivo. AZT can only inhibit HIV by killing infectod and	uninfected target cells. Theory further predicts that AZT is	unacceptable as anti-HIV therapy in HIV-antibody positive persons,	because it will kill 999 uninfected cells for every infected cell. In response to these theoretical considerations it is argued by	the manufacturer of AZT and its collaborators that, contrary to	expectations, AZT is an effective anti-HIV drug, because cell	division was observed to be 2000 to 20,000 times more drug-resistant	than HIV replication (Furman et al., 1986). However, after AZT had been licensed for human use, several	independent studies reported that the drug is about 20 to 1000 times	more toxic to human cells in culture than the manufacturer had	claimed, i.e. that the half inhibitory doses (ID 50) ranged between 1	and 50 µM (Table 1). In accordance with these results, life	threatening toxicity including anemia, leukopenia, nausea, muscle	atrophy, dementia, hepatitis and mortality, has been documented in	humans treated with 20 to 60 µM AZT (Mir & Costello, 1988; Duesberg,	1992; Freiman et al., 1993; Tokars et al., 1993; Bacellar et al.,	1994; Goodert et al., 1994; Seligmann et al., 1994). If these results	were correct, both the dosage of AZT prescribed to humans and the	advisability of AZT as an anti-HIV drug need to be reconsidered. In view of up to a 1000-fold discrepancy between the cytotoxicity	of AZT reported by the manufacturer and his collaborators (Furman et	al., 1986) and the cytotoxicitiesreported by other investigators	(Table 1), we set out to redetermine the cytotoxicity of AZT. We have	investigated the effects of AZT on the human CEM T-cell line and on	several other human and animal cells in culture. In contrast to the	previous studies, that measured toxicity over 1 to 3 rounds of	mitoses, we decided to measure long-term toxicity over several weeks,	representing up to 24 consecutive cell divisions. We reasoned that	this experimental design would more closely mimic human exposure,	which is indefinite, extending over numerous mitoses (Fischl et al.,	1987; Volberding et al., 1990; Physicians' Desk Reference, 1994). Under the conditions AZT is prescribed as an anti-HIV drug, i.e. chronic application, it could indeed be more toxic than it is after	only one or a few mitoses studied earlier, because non-lethal	mutations would accumulate in surviving cells. Our experimental	design would detect cumulative mutational toxicity acquired over	several mitoses, in addition to the complete cytotoxicity observed in	one or a few mitoses. Materials. RPMI 1640 medium, Dulbecco's Modified Eaglets medium, and fetal bovine serum were purchased from Gibco Laboratories (Grand Island, NY). Serum Plus was purchased from JRH Biosciences (Lenexa, KS). AZT was purchased from Sigma Chemical Co. (St. Louis, MO). Table 1. 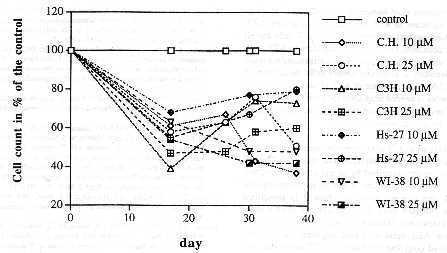 50% inhibitory dose of AZT for human and animal cells as reported by various laboratories. Culture conditions of cells grown in suspension. The CEM human	Iymphoid T-cell line was provided by Robert F. Garry, Tulane	University School of Medicine, New Orleans, LA. CEM T-cells were	suspended in 5 mL of RPMI 1640 medium enriched with 10% Serum Plus in tissue culture flasks (25 cm2 growth area, Falcon) and were	propagated at 37°C in humidified air with 6.5% CO2. The CEM	T-cells were maintained at a density around 3 x 105 cells per mL by diluting them 1:2 every other day. The medium was changed every day	by spinning down the cells for 5 min in a clinical centrifuge at 6000	rpm and then resuspending them in fresh medium. AZT was added twice	every day at 10 and 25 µM concentrations by micropipets with sterile	tips. AZT additions were made at about 12 h intervals. A control	flask of CEM T-cells was passaged identically without the addition of	AZT. A 10 /1L aliquot of evenly distributed cells was counted every	other day with a hematocytometer. Culture conditions of cells grown attached to Petri dishes. The	C3H mouse fibroblast cell line, the Hs-27 human foreskin cell line	and the WI-38 human lung cell line were purchased from the American	Type Culture Collection. The secondary Chinese Hamster lung cells	were prepared from animals in our lab. Each of these cell types was	cultured while attached to Petri dishes (100 x 20 mm, Falcon) in 10	mL of Dulbeccots Mod ified Eagle's medium enriched with 10% fetal	bovine serum at 37°C in humidified air with 6.5% CO2. Each of	the monolayer cell types was sceded of approximateIy I X 105 cells on	a 10-cm dish containing 10 mL of medium. The medium in each dish was	changed every day. AZT additions were also made twice a day at 10 and	25 µM concentrations. The cells were countod with a Coulter counter	by placing a 200 pL sample of evenly distributed cells in 10 mL of	isotonic buffered saline solution. Each AZT-treated culture was split	1:5 when the control dish had reached 100% confluency. Fig. 1. The effect of AZT, at 10 µM and 25 µM, on the growth rate of the human CEM T-cell line maintained as described in the text. The effect of long-term AZT treatment on the viability of the	human CEM T-cell line. To determine the cytotoxicity of AZT on the	human CEM T-cell line in culture, parallel cultures were incubated	with 10 µM, 25 µM AZT and without AZT (see Materials and methods). The	untreated cells were maintained at saturation density of CEM cells,	which is about 3 x 105 cells per mL in our conditions. Each culture	was divided 2-fold every 48 h, by which time the AZT-free control had	regained saturation density. As can be seen in Fig. 1, after four days the cell count of the	culture at 25 µM AZT had been reduced to half of the control, and	that of the culture at 10 µM AZT to two thirds of the control. After	12 days the cell densities of both AZT-treated cultures had been	reduced to a third of the control culture. From then on, the density	of the culture at 25 µM AZT continued to decline at a decreasing	rate, and that of the culture at 10 µM AZT stabilized (Fig. 1). One possible explanation of the decreasing sensitivity of	surviving CEM cells to AZT over time is that the dividing portion of	the cells takes up all AZT in a short time, and that the resting	portion of cells subsequently enters mitosis in a culture depletod of	AZT. Another explanation suggests that variants are selected that do	not incorporate AZT into DNA. To distinguish between these	possibilities each AZT-treated culture was further divided into two. One of the two subcultures was maintained with daily medium changes	containing 10 and 25 µM AZT respectively as before. The other	subculture was supplemented, 12 hours after the medium including AZT	had been changed, with the equivalent of an extra 10 and 25 µM AZT	respectively. All cultures were further incubated under these	conditions for another 32 to 36 days. It can be seen in Fig. 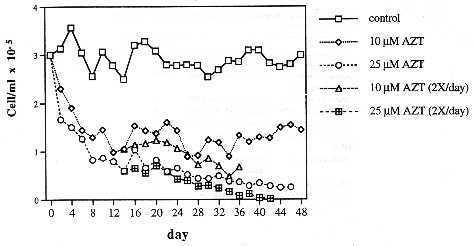 I that even at two daily applications of	AZT at 10 µM, a decreasing fraction of T-cells retained viability for	14 days (when the culture became contaminated). However, no survivors	were observed after 14 days at two daily applications of 25 µM AZT. It is concluded that T-cell variants are selected, on long-term	exposure to AZT, that are relatively resistant to AZT compared to the	average T-cell prior to treatment. The effect of long-term exposure to AZT on the viability of human	and animal fibroblasts. To determine whether other human and animal	cells are similar to human T-cells with regard to AZT-sensitivity,	the viability of a human lung (WI) and foreskin (Hs) cell line, of a	mouse cell line (C3H) and of secondary Chinese hamster cells (C.H.) was studied in AZT. Each of the different cell types was seeded at 1 x 105 cells per	10 cm dish and exposed to AZT at 10 and 25 µM (see Materials and	methods). AZT was added to each dish twice every day, once in the	morning and again at night as described above. The inhibition of cell	growth was expressed as the percentage of cells in the AZT culture	compared to that of the untreated control. The cells were counted by	the time the control had reached confluency (Fig. 2). The first count	of cells was taken at the end of two weeks when all control dishes	had become completely confluent. Thereafter control cells were split	1:4 and allowed to reach confluency again. This process was repeated	several times as shown in Fig. 2. As can be seen in Fig. 2, the general pattern of AZT-sensitivity	observed with T-cells was confirmed with other human and animal	cells. C3H mouse cells appeared to be most sensitive to the effects	of AZT. At day 14, the densities of C3H cells, maintained at both	concentrations of AZT, had already declined to below 50 percent of	the control. Possibly due to a counting error, the density of C3H	cells at 10 µM AZT appeared lower than that of cells at 25 µM AZT. After the same time, the concentrations of Hs-27, WI-38, and C.H. cells ranged from 50 to 60 percent of the control at 25 µM AZT, and	from 60 to 70 percent of the control at 10 µM AZT. From 14 to 38 days of AZT treatment all fibroblast cells remained	at about half the density of the controls. However, the densities of	C3H and Hs-27 cell lines gradually increased over time at both	concentrations of AZT. By day 38, the density of Hs-27 cells at both	AZT concentrations had reached up to 80 percent of the control. Fig. 2. The effect of AZT, at 10 µM and 25 µM, on the growth of	human lung (Wl), and foreskin cells (Hs), on mouse fibroblasts (C3H)	and on secondary Chinese hamster (C.H.) fibroblasts. AZT-treated	cells were counted whenever the untreated control culture had reached	confluency. (i) AZT toxic to human cells in the micromolar range. Our results	indicate that long-term exposure to AZT inhibits the growth of human	CEM T-cells about 50% at 10 µM, and gradually up to 100% at 25 µM. Similar results were obtained with human lung and foreskin cells, and	also with mouse and Chinese hamster cells, although complete	inhibition was not observed with any of these cells under our	conditions. Thus our results confirm and extend those of others	summarized in Table 1, that AZTis toxic to human cells in the	micromolar range. Indeed AZT, like all other nucleotide analogs of	DNA,is expectod to be toxic in the micromolar range, because the	Michaelis constants of authentic nucleotide triphosphates are also in	the micromolar range (Kornberg, 1980). These results are incompatible with the claim of the manufacturer	and its collaborators that AZT is only toxic to human cells in the	millimolar range. That claim is also hard to reconcile with the	manufacturer's own observation that HIV replication is inhibited by	AZT at 0.05 to 0.5 µM (Furman et al., 1986). Since (i) HIV and cell	DNA are both replicated in vivo inside the same cellular vesicle and	at the same time (Rubin & Temin, 1958; Weiss et al., 1985), (ii)	retroviral and cellular DNA synthesis depend on the same	triphosphatepools, and (iii) retroviral DNAis a 105-fold smaller	target for AZT than cell DNA, HIV DNA synthesis cannot be more	sensitive to AZT than cell DNA. In fact target theory predicts the	opposite. Thus the preponderance of evidence casts doubts on the claim of	the manufacturer of AZT and its collaborators that AZTis only toxic	to cells in the millimolar range (Furman et al., 1986). (ii) Resistance of human and animal cells to longterm exposure to	AZT. Unexpectedly, partially AZT resistant variants emerged from human	T-cells and all other cells testod on continued exposure to AZT at 10	to 25 µM for 38 to 48 days. These variants did not reach the densities	of untreated control cells, but continued to divide in the presence	of AZT at various rates. Further work is needed to analyze the basis	for the relative AZT-resistance acquired by human and animal cells	upon long-term exposure to AZT. (iii) Toxicity of AZTat micromolar concentrations calls for	reoppraisal of its use as an anti-HlV drug. The cell culture results	described by us and others predict that AZT is toxic to humans at the	20 to 60-micromolar level, the concentrations at which it is	prescribed as an anti-HIV drug. Even though our results show that	human and animal cells acquire some resistance against AZT upon	long-term exposure, no cell has achieved complete resistance to AZT	under the conditions tested. This prediction is confirmed by numerous	clinical studies that describe life threatening toxic effects in	humans treatod with AZT at 20 to 60 µM (see Introduction). Thus our	data and those of others call into question the merits of AZT as an	anti-HIV drug, particularly at the doses currently prescribed to	humans. We thank Robert F. Garry, Tulane Univ. New Orleans, for the human	CEM T-cell line and for generous advice, and Gedge D. Rosson, UC	Berkeley, for preliminary results and discussions. This investigation	was supportod in part by the Council for Tobacco Research, USA, and	private donations from Thomas Boulger (Redondo Beach, Calif., USA),	Glenn Braswell (Los Angeles, Calif., USA), Dr. Richard Fischer	(Annandale, Va., USA), Dr. Fabio Franchi (Trieste, Italy), and Dr.	Peter Paschen (Hamburg, Germany). Avramis, V.l., W. Markson, R.L. Jackson & E.	Gomperts, 1989. Biochemical pharmacology of zidovudine in human	T-lymphoblastoid cells (CEM). AIDS 3: 417-422. Bacellar, H., A. Munoz, E.N. Miller, B.A. Cohen,	D. Besley, O.A. Seines, J.T. Becker & J.C. McArthur, 1994. Temporal trends in the incidence of HIV-I -related neurologic	diseases: Multicenter AIDS CohortStudy, 1985-1992.Neurology44:	1892-1900. Bagasra, O., S.R Hauptman, H.W. Lischner, M. Sachs	& R.J. Pomerantz, 1992. Detection of human immunodeficiency virus	type I provirus in mononuclear cells by in situ polymerase chain	reaction. N. Engl. J. Med.326: 1385-1391. Balzarini, J., R Herdewijn & E. De Clercq,	1989. Differential pattems of intracellular metabolism of	2',3'-didehydro-2',3'didexoythymidine and	3'-azido-2',3'-dideoxythymidine, two potent anti-human	immunodeficiency vims compounds. J. Biol. Chem.264:6127 6133. Duesberg, RH., 1992. AIDS acquired by drug	consumption and other noncontagious risk factors. Pharmacology &	Therapeutics 55: 201-277. Duesberg, RH., 1993. HIV and AIDS. Science 260:	1705. Fischl, M.A., D.D. Richman, M.H. Grieco, M.S. Gottlieb, RA. Volberding, O.L. Laskin, J.M. Leedon, J.E. Groopman, D.	Mildvan, R.T. Schooley, G.G. Jackson, D.T. Durack, D. King and the	AZT Collaborative Working Group, 1987. The effficacy of	azidothymidine (AZT) in the treatment of patients with AIDS and	AlDS-related complex. N. Engl. J. Med.317: 185-191. Freiman, J.R, K.E. Helfert, M.R. Hamrell &	D.S. Stein, 1993. Hepatomegaly with severe steatosis in	HlV-seropositive patients. AIDS 7: 379-385. Furman, RA., J.A. Fyfe, M. St Clair, K. Weinhold,	J.L. Rideout, G.A. Freeman, S. Nusinoff-Lehrman, D.R Bolognesi, S.	Broder, H. Mitsuya & D.W. Barry, 1986. Phosphorylation of	3'-azido-3'deoxythymidine and selective interaction of the	5'-triphosphate with human immunodeficiency virus reverse	transcriptase. Proc. Natl. Acad. Sci. USA 83: 8333-8337. Goedert, J.J., A.R. Cohen, C.M. Kessler, S.	Eichinger, S.V. Seremetis, C.S. Rabkin, F.J. Yellin, RS. Rosenberg	& L.M. Aledort,1994. Risks of immunodeficiency, AIDS, and death	related to purity of factor Vlll concentrate. Lancet 344:	791-792. Gogu, S.R., B.S. Beckman & K.C. Agrawal, 1989. Anti-HIV drugs: Comparative toxicities in murine fetal liver and bone	marrow erythroid progenitor cells. Life Sci. 45: iii-vii. Horwitz, J.R, J. Chua & M. Noel, 1964. Nucleosides. V. The monomesylates of	1-(2'-deoxy-beta-Dlyxofuranosyl)thymidine. J. Org. Chem. 29:	2076. Inoue, T., K. Tsushita, T. Itoh, M. Ogura, T.	Hotta, M. Saneyoshi, S. Yoshida, H. Saitoh, Y. Tomoda & Y. Nagai,	1989. In vitro bone marrow toxicity of nucleoside analog against	human immunodeficiency virus. Antimicrob. Agents Chemother. 33:	576-579. Komberg, A., 1980. DNA Replication. Freeman and	Company, San Francisco. Lema~tre, M., D. Guetard, Y. Henin, L. Montagnier	& A. Zerial, 1990. Protective activity of tetracycline analogs	against the cytopathic effect of the human immunodeficiency viruses	in CEM cells. Res. Virol. 141: 5-16. Mansuri, M.M., M.J.M. Hitchcock, R.A. Buroker,	C.L. Bregman, 1. Ghazzouli, J.V. Desiderio, J.E. Starrett, R.Z. Sterzycki & J.C. Martin, 1990. Comparison of in vitro biological	properties and mouse toxicities of three thymidine analogs active	against human immunodeficiency virus. Antimicrob. Agents Chemother. 34: 637-641. Mir, N. & C. Costello, 1988. Zidovudine and	bone marrow. Lancet ii: 1195-1196. Piatak, M., L.C. Saag, S.C. Yang, S.J. Clark, J.C.	Kappes, K.-C. Luk, B.H. Hahn, G.M. Shaw & J.D. Lifson, 1993. High	levels of HIV-I in plasma during all stages of infection determined	by competitivePCR. Science259: 1749-1754. Richman, D.D., M.A. Fischl, M.H. Grieco, M.S. Gottlieb, RA. Volberding, O.L. Laskin, J.M. Leedom, J.E. Groopman,	D.
Mildvan, M.S. Hirsch, G.G. Jackson, D.T. Durack,	S. NusinoffLehrman andthe AZTCollaborative Working Group,1987. The	toxicity of azidothymidine (AZT) in the treatment of patients with	AIDS and AlDS-related complex. N. Engl. J. Med. 317: 192-197. Rubin, H. & H. Temin, 1958. A radiological	study of cell-virus interaction in the Rous sarcoma. Virology 7:	75-91. Seligmann, M., D. A. Warrell, J.-R Aboulker, C.	Carbon, J.H. Darbyshire, J. Dormont, E. Eschwege, D.J. Girling, D.R. James, J.-R Levy, RT.A. Peto, D. Schwarz, A.B. Stone, l.V.D. Weller,	R. Withnall, K. Gelmon, E. Lafon, A.M. Swart, V.R. Aber, A.G.	Babiker, S. Lhoro, A.J. Nunn & M. Vray,1994. Concorde: MRC/ANRS	randomised double-blind controHed trial of immediate and deferred	zidovudine in symptom-free HIV infection. Lancet 343: 871-881. Simmonds, R, R Balfe, J.F. Peutherer, C.A. Ludlam,	J.O. Bishop & A.J. Leigh-Brown, 1990. Human immunodeficiency	virus-infected individuals contain provirus in small numbers of	peripheral mononuclear cells and at low copy numbers. J. Virol. 64:	864-872. R.B. Diasio & J.-R Sommadossi (eds.) Pergamon	Press Inc., New York. Tokars, J.l., R. Marcus, D.H. Culver, C.A. Schable, RS. McKibbe, C.l. Bandea & D.M. Bell, 1993. Surveillance	of HIV infection and zidovudine use among health care workers	aÎter occupational exposure to HlV-infectod blood. Ann. Intem. Med. 118: 913-919. Volberding, RA., S.W. Lagakos, M.A. Koch, C.	Pettinelli, M.W. Myers, D.K. Booth, H.H. Balfour Jr., R.C. Reichman,	J.A. Bartlett, M.S. Hirsch, R.L. Murphy, W.D. Hardy, R. Soeiro, M.A. Fischl, J.G. Bartlett, T.C. Merigan, N.E. Hyslop, D.D. Richman, F.T. Valentine, L. Corey and the AIDS Clinical TAal Group of the National	Institute of Allergy and Infectious Disease, 1990. Zidovudine in	asymptomatic human immunodeficiency virus infection: A controlled	trial in persons with fewer than 500 CD4-positive cells per cubic	millimeter. N. Engl. J. Med. 322: 941-949. Weiss, R., N. Teich, H. Varmus & J. Coffin,	1985. Molecular Biology of RNA Tumor Viruses. Cold Spring Harbor	Press, Cold Spring Harbor, NY. Yarchoan, R., J.M. Pluda, C.-F. Pemo, H. Mitsuya	& S. Broder, 1991, Anti-retroviral therapy of human	immunodeficiency virus infection: current strategies and challenges	for the future. Blood 78: 859-884.